Pictured Rocks National Park was known for its multicolored sandstone cliffs 300 feet above Lake Superior, its waterfalls, hiking trails, a famous logging slide, and sand dunes. It is also known for sunken ships and the many items that have floated ashore after a storm. The Cooper family from Lansing, Michigan had chosen this site for their summer vacation. Ben had visions of finding important treasures, like a cannon ball, a piece of gold, or other historical relics of importance, along the 40 mile shoreline. Bekka had her camera along and was eager to get scenic pictures of Lake Superior the Park’s unique rock formations, wild life, and family memories. It wasn’t long before the two met a new friend, Eli, who was on a kayaking trip with his dad. Family fun, campfire dinners, and roasting “s’mores” became a shared adventure. Plans were made for a visit to the Miner’s Castle, kayaking with Eli, and completing the suggested activities in their Junior Ranger book while they learned to preserve nature and observe the many birds and animals throughout the park. A trio of mysterious acting strangers came to their attention and before long the Cooper family became involved in some fast moving action of a serious nature. As the activities of the mystery men heightened Becca, Ben, and Eli, covertly watched from a distance. Soon the family was in danger as the men realized they had been discovered. 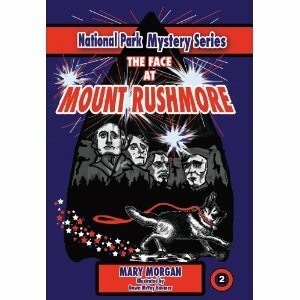 Mary Morgan knows how to build suspense, involve her reader, and keep them guessing. Her writing is informative, filled with core values, significant history, and quality family entertainment. Illustrator Dawn Baumer captures the fun and reinforces Mary’s delightful dialog, story line, and word pictures. Readers will also enjoy the added features: Recipes for Hobo Dinners and S’mores, the poem “the Song of Hiawatha by Henry Wadsworth Longfellow, The Semaphore Alphabet, and facts about Lake Superior, with pictures of Maritime artifacts which have drifted on shore from some of the 350 recorded shipwrecks in Lake Superior. “Stolen Treasures at Pictured Rocks” is an ideal book for gift giving, for family reading, as well as for home schooler’s, and for Christian school libraries. Nan Baker captivates and enchants her young audience by using a poetic story form that stirs the creative imagination of the reader. “Work, Work, Work” is a read aloud coloring book. The clever illustrations depict the action of the story and help the reader visualize the word pictures of the narrative. The story features the hard working Cedric Mouse and his neglected, but faithful friend, Miss Mandy Mouse. Cedric’s hard work and enterprising activity pay dividends in financial reward and success for his factory called Chamberlin’s Shed. Cedric make a discovery – something is missing. Settled by Henry Chamberlain in 1850 it was originally called Chamberlain’s Siding and later changed to Three Oaks. “Work, Work, Work” is a tribute to Henry Chamberlin. Dedicated to the hundreds of children Nan has taught, the book is written as a reminder to the citizens of the Three Oaks community and their children, and for the generations of children, yet to come of the importance of balancing hard work while putting friendship first.